Gamera: Super Monster (1980) Review – AiPT! I thought it couldn’t get any worse than Gamera vs. Zigra, but I was a fool. Nearly 10 years after their last Gamera flick soiled theaters, Daiei elected to give the series a grand, if belated, finale. Except they didn’t want to spend a lot of money. The end result is Gamera: Super Monster, the last film in the Showa Gamera series and nothing more than a glorified clip movie. The evil galactic empire known as the Zanon have come to conquer the Earth. Our planet’s mightiest superheroes, the Spacewomen, are no match for the alien forces and so they call upon Gamera to stop the imperial menace. To defeat Gamera, the Zanon summon all of his greatest foes! Gyaos! Zigra! Viras! Jiger! Guiron! Barugon! Gamera must defeat them all a second time, and coincidentally, in precisely the same way he defeated them the first time! I guess if Godzilla had his All Monsters Attack then Gamera had to have his Super Monster. But even Gamera’s clip movie is cheaper, stupider and more annoying than the Big G’s. Always the bridesmaid, aren’t you, Gamera? Coming well after the advent of modern blockbuster filmmaking, Gamera: Super Monster deliberately plays up the campiness and goes straight for a retro B-movie feel. What few original special effects we get are deliberately bad. And I mean REALLY bad. The opening sequence is a slideshow of production art, the Spacewomen flying effects make Superman IV: The Quest for Peace look groundbreaking, and the sets… There’s a part where the Spacewomen use their flying, glowing space-van to travel to a pocket dimension to speak with their disembodied alien commander, and the “pocket dimension” is rendered as a vacant room lined with white linen. The Gamera content is almost entirely comprised of clips from previous films. In that regard, Gamera: Super Monster does sort of function as Gamera’s Greatest Hits. So if you want to skip all the other movies in the series and just watch the monster battles, then they’re all here in a convenient package. Director Noriaki Yuasa shuffles them up, so Gamera doesn’t fight his enemies in the same order he did throughout the series. They actually save Barugon for last, playing him up as Gamera’s ultimate nemesis and final obstacle; a throwback to how Barugon, the ice monster, was originally introduced as the natural predator of Gamera, the fire monster. 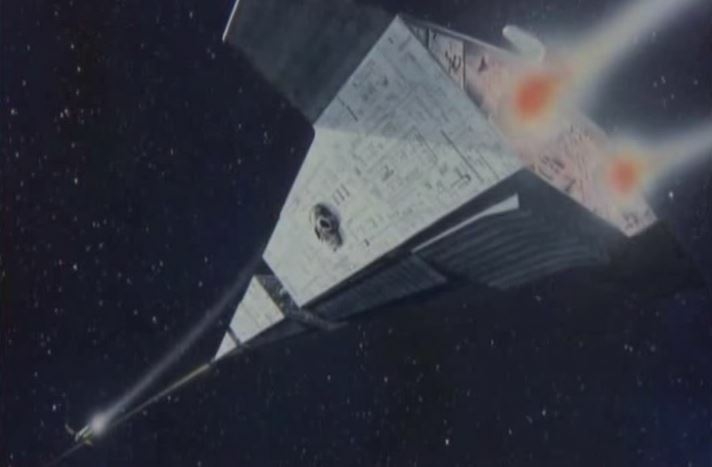 As for new Gamera footage, all you really get is a brief sequence in the final minutes where Gamera confronts the Zanon warship (that looks suspiciously like a Star Destroyer) and sacrifices himself to blow it up. Yeah, Daiei brought Gamera back in the world’s cheapest clip movie just so they could kill him off in a bad parody of Star Wars. I suppose the real crime of Gamera: Super Monster isn’t that it’s a clip movie, or that the special effects in the Spacewomen segments are bad, but that it takes nearly a half hour for Gamera to f----n show up. You have a movie made up of nothing but clips of Gamera fighting monsters and yet they STILL find a way to delay the monster action! Ugh. So this is how the Showa era Gamera series ends: The worst kind of whimper imaginable. If it’s any consolation, the Heisei series produced in the ‘90s by Director Shusuke Kaneko feature some of the BEST kaiju films ever made. So don’t give up on Gamera just yet. This may be the nadir of his franchise, but his finest hour is just around the corner.